Latest Premier League News. Manchester United struggling midfielder Bastian Schweinsteiger is back after to the training camp after several months. 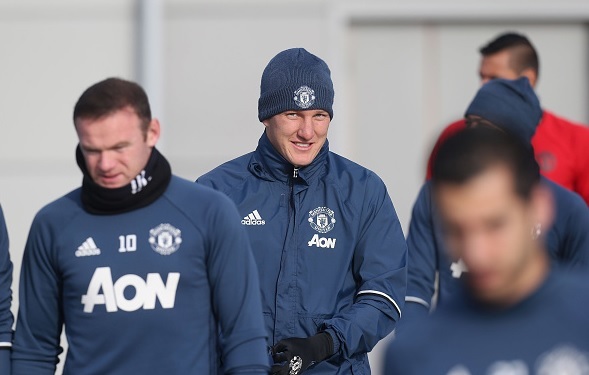 Manchester United struggling midfielder Bastian Schweinsteiger is back after to the training camp after several months. The 32-year-old German star has been out of favour under new boss Jose Mourinho since the summer. Schweinsteiger who joined the Red Devils from Bayern Munich for £14.4million last year made 31 appearances last term but the new Portuguese manager dropped him out of the squad when he joined the Old Trafford side. Whats New in Premier League? Despite being a part of Premier League squad the Germany international was training with the under 21 side and was also not the part of Europa League squad. He is yet to make a debut under Mourinho, however he was spotted in the training session earlier today. After a poor run by the Red Devils, Mourinho is likely to reintroduce him to regain the form. Henrikh Mkhitaryan was also seen in the training, he is yet to cement his place. Injury prone defender Phil Jones has also returned to training and could be returning to first team action soon. The return of Jones has given a boost to the boss as Antonio Valencia and Eric Bailly are both out for the remainder of the year. United will be playing the fourth group game against Fenerbahce in a Group A Europa League clash this Thursday.